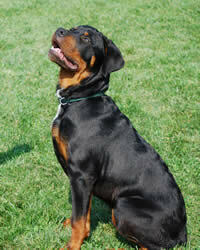 Visit our Rottweiler dog names page. The Rottweiler is a confident and imposing dog. They have a dominant and stubborn nature, they are very loyal and they make excellent guard dogs. Due to their nature, they require consistent training and socialization. These dogs can be overly protective of family members and may revert to herding instincts around children. The Rottie, as they are often known, is descended from Roman drover dogs, and they were bred in Germany when many of the Roman troops settled in the area. The dogs served as guard animals until the mid-19th century, when dog carting was replaced by the railroad. The Rottweiler is a bold, confident breed. They can be headstrong and stubborn and often take a domineering approach. These dogs can be overly protective and are wary of strangers. They are very loyal dogs, but require consistent training. Living Environment – Rotties need a large and secure area for both exercise and play. Space is important in large part due to the size of the dogs. They are protective around strangers, but can thrive around children that are brought up with them. These dogs also do well with older children who know how to behave with them. They must be exposed early to other pets to prevent aggression. Grooming – This dog breed requires little in the area of grooming. Weekly brushing can keep the coat in good condition. Brushing may be needed more frequently when the dog is shedding, and the breed is considered a medium shedder. This should be considered for households that contain members with allergies. Diet & Exercise – The diet for these large dogs should be portioned in order to prevent overeating. They require at least two hours of exercise daily. A large yard for play is recommended, and these dogs also enjoy long walks. and allergies. Parents should have heart clearance as well as OFA and CERF certificates. The Rottweiler is a very intelligent dog that can excel at training if given the chance. Obedience training is mandatory with these dogs, and owners must show dominance. While the dogs can be stubborn, they are able to perform in many trials and sports.